The darling of unlocked phone enthusiasts, Honor, had a big Amazon Prime Day sale, offering the Honor View 10 for $399, or the lowly Honor 7X for just $169. It seems that the company might have been clearing up inventory to make way for the next behemoth in the series, and we mean that literally. While we already had numerous leaks about the upcoming Honor Note 10 and its giant 6.99" display, seeing the thing in flesh and blood, or, at least, in some spy shots claimed to be the thing, is a jaw-dropping experience. Granted, the top and bottom bezels are rather slim, and if you boost the contrast of the photo, a hidden notch seems to appear, but the phone is still positively, gigantically place-occupying. Unless it is a good rendering job, of course, as the perspective seems a bit off. 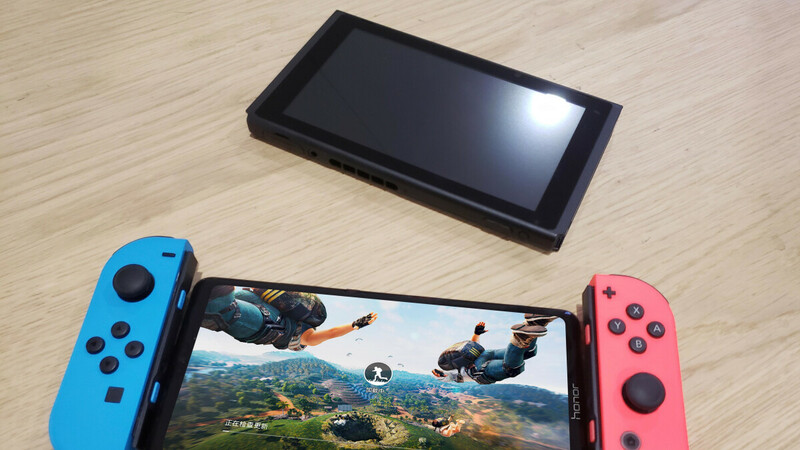 The Note 10 is set next to a Nintendo Switch below, and could easily take its place between the two gamepad sides. On the positive side, if Honor is going to tout this as its go-to device for media and gaming, that's a good shot, and the rumored giant 6000 mAh battery could make it the phone of choice for long sessions away from the charger. It will all be revealed a week from now when the phone is expected to be unveiled. Nintendo looks lame, it's gaming device with 2014 hardware. Yes, yet It has much better games than iOS and Android combined. Of course. I'm talking about hardware alone, it's because Nintendo is cheap company who can't make decent hardware. Nintendo doesn't rely on specs to sell their products, they have innovative gameplay and a loveable formula that can't be replicated. True, but just imagine if company like Samsung or even Xiaomi build the hardware for them. The best mobile gaming experience shouldn't having compromise with subpar hardware quality. they sacrificed hardware for portability and it has been selling very well. why change what is not broken? Let's be honest... The only thing Nintendo has is Mario, Zelda, Smash Bros and Variables of those games. If those games and their characters were available on any other console, Nintendo wouldn't even be relevant when it comes to hardware. Nintendo is the only company, that profits even on hardware sales. No I'm not talking about GPU or it gaming performance. Just it's s**tty screen and turd like form. Wouldn't you agree? Nice looking device, but it gets one demerit for having the 'Honor' name stamped on the front of it. Come on guys, even Samsung quit doing that.